Today we review a green book that not only is printed on recycled paper (50% PCW) and processed chlorine-free, but also goes green with Eco-Libris - 625 trees are planted with us for the first edition of this beautiful book. Born and raised in England and of Sikh-Panjabi heritage, Navjot Kaur has always found ways to identify with her environments. During her academic years, she unearthed valuable insights into the connections between 17th century Spanish Literature with that of the Panjabi Classics. Experiences across these diverse cultural borders have enriched her sense of global citizenry; forging her forward not only as an author, but also, as an educator and mother. Having already led diversity initiatives within her schools, A Lion's Mane is her first children's book, a story that contextualizes the many connections we share as global citizens. Navjot is a member of the Society of Children's Writers and Illustrators and currently resides in Canada with her husband and son. In this beautifully illustrated story, young readers journey to cultures around the world to explore the meaning of the dastaar, or turban of the Sikhs. Allusive words placed within a vibrant red dastaar help promote our connections as global citizens and encourage dialogue around issues of identity and kinship. 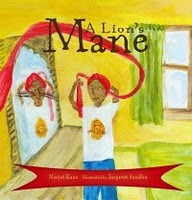 A Lion's Mane promises to be a staple on the shelves of all young visionaries. What we think about it? This is a beautiful book. Literally. Not only the content and message of the book are simply beautiful and moving, but also the marvelous illustrations of Jaspreet Sandhu that gives you the feeling that you're looking into an art work and not just a book. This book is dealing with Sikh identity, but anyone and especially kids, who come from a different background of their surroundings, will easily identify with the hero's quest for meaning and understanding of his place in the cultural circles that he belongs to. His acceptance and pride eventually in his uniqueness are actually not the end of his journey, but just the beginning. Although this journey that follows the winding red dastar (turban) may be demanding and requires the reader's full concentration, it's definitely rewarding. At at the end of the book, you might even find yourself smiling and having a moment of optimism, as this book is filled with a positive spirit that is definitely contagious. Bottom Line: Beautiful and meaningful book! Disclosure: We received a copy of this book from the author. If you're looking for other interesting green-themed books, you are invited to check out our green books page on Eco-Libris website's green resources section.